A lonely stretch of highway. A woman in peril. The wrong place at the wrong time. 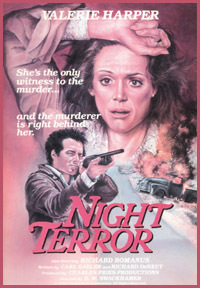 Originally aired on February 7, 1977, Night Terror is an exciting TV cat and mouse exercise directed by E.W. Swackhamer and starring Valerie Harper. Recalling both Steven Spielberg's Duel (1971) and also Philip Leacock's Dying Room Only (1973), Night Terror is equally good in its own right. What is it about the desert that made it so enticing to filmmakers (particularly in television) throughout the Seventies? Perhaps these locations were chosen due to budget issues, ease of access, etc. In any case, they made fetching settings for thrillers because of the isolation and sometimes brutal (if beautiful) conditions. Even sequences that took place in broad daylight...when set in the desert...still packed a punch. Along a dusty, deserted road...a man (Richard Romanus) is engaged in target practice on a sign that reads "500.00 fine for littering." The large scar on his chest and neck, along with his ID dog tags, reveal him to be a war veteran. A mute, his only way of communicating is to put a speakerbox to his throat, which makes him sound like a machine of some kind. In Phoenix, Arizona, the Turney family prepares to move to Denver, Colorado. Carol (Valerie Harper) is a nervous wreck. Her sister Vera (Beatrice Manley) is there to help and she is going to fly out first to Denver with the Turney children, Nancy (Quinn Cummings) and Buddy (Damon Bradley Raskin). Carol and her husband Walter (Michael Tolan) will drive to their new home after he returns from a quick business trip to Los Angeles. They will spend the night in a local hotel and the time alone will be a sort of second honeymoon for the couple. Meanwhile, the war vet stops by a coffee shop and unsettles the waitress (Jan Burrell) with his strange behavior. On a pay phone outside, he speaks with a person who says he is to have "the goods" to him by the next day. The vet hops in his car and heads towards...Phoenix. The evening arrives and Carol is in the hotel room waiting for Walter when she receives a call from him. He tells her he has been delayed and cannot make it back that night. Carol might just have to drive to Denver by herself, a prospect she does not relish. "It's an interstate all the way up so it won't be too bad," Walter assures her. Shortly after, Carol hears from Vera that Buddy is ill and has been admitted to a hospital. Doctor Jacobson (Edward Cross) gets permission to perform surgery on the boy and Carol informs her sister that she is going to fly out immediately. Carol tries to call Walter but when she can't reach him and no flights are available due to a snowstorm in Denver, she decides to drive. After leaving a note for Walter at the front desk, Carol gets into her station wagon for the long trip. She gets directions to Interstate 17 from the parking attendant (Charles Parks), who tells her it's a 16-hour drive. With much on her mind, she nearly has an accident at an intersection. Running on empty, she pulls into a gas station but the two obnoxious workers (Gary Springer & Gary Barton) on duty are closing up and would rather jump into a van with their girlfriends (Linda Lukens & Dinah Manoff). Deciding to take a chance, Carol gets onto the highway and soon sees a police car engaged in a high-speed chase. The officer pulls over the speeding car and just as Carol is asking where she can get gas, she witnesses the cop being shot to death by the war vet's high powered rifle. His body falls onto her windshield and the killer then shines a bright light into Carol's face, getting a good look at her before she quickly drives off. Now frantic and aware that she's being targeted, Carol unsuccessfully tries to get aid from the van with the gas station louts. However, she is able to lose the killer by driving onto a frontage road. While trying to phone for help from a call box, Carol panics when she sees headlights coming towards her...mistakenly believing it to be the killer's vehicle. Driving further, she finds a diner and gas station but it seems to be abandoned. Despite a "gone hunting" sign in the window, Carol is intent on fueling up. She finds the gas pump key in the cash register but has to pry open the power box with a crow bar to get the electricity turned on. But she is not alone and is startled to find a derelict (John Quade)...whom she thinks at first might be the killer, having never seen his face. When she realizes the man is harmless, she fills her tank and pays him for helping her load a footlocker back into the station wagon. A decent person to a fault, she also leaves money and a note in the register. Back on the main road, the killer finds her again and remains in pursuit. It begins to rain and Carol comes across a parked sports car. The man inside (played by Nicholas Pryor) is drunk and doesn't seem to believe Carol's story that someone is trying to murder her. After sitting in the car and listening to his blabbing, Carol spots the killer's car nearby. The drunk gets out to reassure her that she isn't in danger and is shot at close range. Carol, now witness to two murders, steps on the gas of the dead man's car and drives back into the killer's vehicle, disabling it. He now has to use Carol's station wagon to go after her...but finds himself stalled when it overheats. Carol, who briefly gets stuck in a ditch, deftly manages to get away. Morning comes and Carol is nearly out of gas again. She finds a house with an Indian couple (John War Eagle & Madeleine Taylor Holmes) and tries to use a phone. They don't have one but a home four miles away does. Carol asks if she can borrow a pick-up truck and the husband tells her that their son, who is working in the fields, has the key and won't be back for a while. Carol cannot wait any longer and tells him she will walk the distance. The old man says he will send his son after her when he gets back home. While walking along the road, Carol is delighted when the truck pulls up alongside her and picks her up. But she feels something's not right. There isn't a key in the ignition, the driver's clothes are too clean and he is wearing an expensive watch for a farmer's son. After a struggle, Carol jumps out of the moving vehicle as the truck comes to a crashing halt. With her pursuer coming towards her, she grabs the shotgun but cannot bring herself to use it. Instead, she leaps into the truck and runs him down, severely injuring him. A helicopter is hovering overhead and she quickly uses her wits to get its attention by setting the truck on fire. Reunited with her son in the Denver hospital, she is joined by Walter...who has no idea of what she's been through. There are some nice touches in Night Terror. The scene in which Carol attempts to put gas in her vehicle outside the desolate gas station is filled with real-time extraneous flourishes, true life pauses and bumpy stops that enhance the suspense. The sequence seems to take forever...and the tension builds healthily because of it. The tragic audiences of today, plagued by Attention Deficit Disorder and so used to quick editing and over-the-top action, wouldn't tolerate such a thing. It's their loss. Like Duel, in which a cowardly Dennis Weaver is forced to fend for himself in a harrowing game of survival, Night Terror boasts a terrific character arc. Valerie Harper (still starring in Rhoda at the time) goes from a wife thoroughly dependent on her husband to a self-reliant and tough woman who gets the job done. Harper's straightforward style gives gentle nuance to Carol's development, smoothing and rounding the edges of transition as only a good actress can. By the end of Night Terror, the viewer barely realizes he's gone from watching a scatterbrained woman who can't find her coffee to a determined woman hellbent on survival by shotgun, vehicular manslaughter or explosive fire! Indeed, the down-to-earth actress (who should have had a stronger post-Mary Tyler Moore and Rhoda career) is first rate throughout. It's a one-woman show and she delivers. Proving she was top-notch in these kinds of thrillers when given the chance, Harper was quite good in Don't Go To Sleep (1982) and was the best thing in 1988's rather refried The People Across the Lake. The occasional film and stage work keeps her busy these days. E.W. Swackhamer directed a variety of TV series including episodes of The Partridge Family, the long running Bewitched and also I Dream of Jeannie. Swackhamer's plethora of work includes 1976's excellent telechiller Death At Love House. And while he also helmed Vampire (1979), his resume remains a diverse offering; he worked until his death in 1994 at the age of 67. The original score by Fred Steiner is a perfect match for Swackhamer's direction and is reminiscent of the strains used so effectively by Bob Clark's preferred composer Carl Zittrer in 1974's Black Christmas. Executive Producer Charles W. Fries enjoyed forays into horror made for the small screen. Among his other credits are The Norliss Tapes (1973), Scream of the Wolf (1974) and The Spell (1977), as well as Night Cries and The Initiation of Sarah (both 1978).